Another year of the OMiG Digital Marketing Awards has come and gone. Last Friday the 2017 award winners were announced by host, Robin Chedgey, at a fantastic ceremony at the Town Hall Theatre. The standard and level of creativity has increased year on year and there were many outstanding examples of excellent digital marketing campaigns. 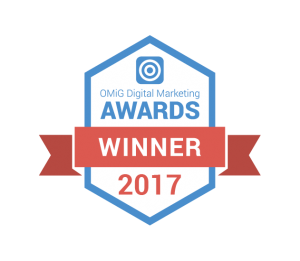 BEST STUDENT DIGITAL MARKETING PROJECT – DASH, (Driving All Students Home), created by NUI Galway final year student Richie Commins. BEST DIGITAL MARKETING (≤ 10 employees) Clean Cut Meals, the first meal prep company in the West of Ireland. BEST DIGITAL MARKETING (> 10 employees) KAI Restaurant, owned by David and Jessica Murphy. BEST WEBSITE (≤ 10 employees) Baboró International Children’s Festival, whose mission is to inspire children to engage with the world through their experience of the creative arts. BEST WEBSITE (> 10 employees) Evergreen Health Food is Ireland’s leading online health and food store. PEOPLE’S CHOICE (≤10 employees) Niamh Burke Nutrition, Niamh is a Dietary Coach who provides nutritional advice. PEOPLE’S CHOICE (>10 employees) An Pucán, Galway’s bar and restaurant serves the finest food and drink, all set to the backdrop of live music sessions. SPECIAL RECOGNITION (BEST DIGITAL) Floralesque Blog provides a whimsical view into the enchanting world of fashion and beauty. Once again, it is essential to note, that the awards would not be possible without our partners, sponsors and volunteers. The awards are held in partnership with Galway’s Local Enterprise Office, the Connacht Tribune Group, Bentley Productions, Cantec, IE Domain Registry and this year OMiG were proud to have AIB as the main events sponsors. Congratulations to all the nominees and winners from all the team at OMiG, your hard work continues to increase standards and inspire others across Galway. For more information on upcoming OMiG events, follow @GalwayMarketing on Twitter and Facebook.